These are really fudgey, gooey brownies. If you are a cakey brownie person (why though? Cakey brownies are obviously inferior.) these are not for you. These brownies really foxed me at first; the original recipe called for a 9" x 13" pan and I just couldn't get them to bake properly at that size. When the condensed milk was perfectly bubbly and golden brown on top, the brownies in the middle of the pan were still oozingly raw. I solved the problem by halving the recipe and using an 8" x 8", without skimping at all on the condensed milk. 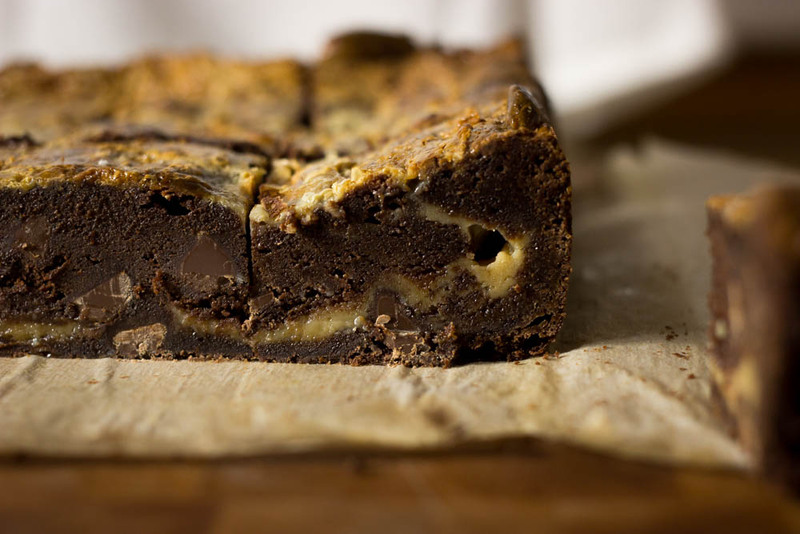 This did the trick and I got soft, gooey, just-set brownies with a frankly shocking amount of swirly puddles of condensed milk through the bars and a crispy-crackly caramelized top. In a small saucepan, melt butter over medium heat. When the butter is melted, remove from heat and stir in chocolate. Let the heat from the butter melt the chocolate, stirring occasionally until fully melted and incorporated. In the bowl of a stand mixer, whip eggs, sugars, vanilla and espresso powder on a medium-high speed. Whip until very fluffy and pale yellow, around 8 minutes. While the eggs whip, whisk together flour and coco in a medium bowl, making sure there are no clumps. Pour about 2/3 of the condensed milk over the top of the batter, and swirl around with a toothpick. Bake for about 10-15 minutes, until the top is starting to caramelize and bubble. Pour over the remaining milk and sprinkle with a big pinch of flaky salt. Saving some milk to add later helps make sure that you get a chewy caramelly top and it doesn't all sink into the batter. Continue to bake for about 10-15 minutes, until all the caramel is bubbly and caramel brown. Let cool completely and cut into small squares.